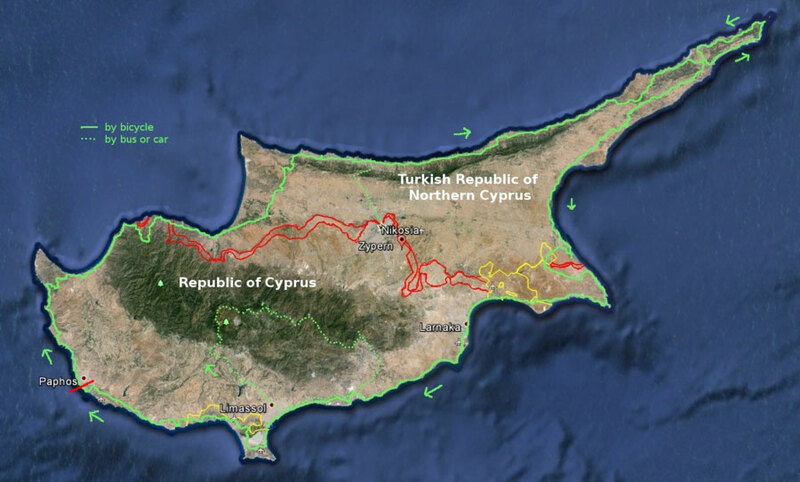 756 km bicycle trip around the island, across Republic of Cyprus and Turkish Republic of Northern Cyprus, with a detour by rental car from the island´s south to Troodos Mountains. Do you like Cycling Cyprus? From Paphos airport we took an expensive taxi to the previously booked accommodation in Paphos to unpack the bikes there in peace. Two days we relaxed on the beach and at the pool, took the bus to the archaeological site west of Paphos and the royal tombs. Then we headed north, first on asphalt, then behind the Coral Bay on gravel road to Lara Beach and across the natural Akamas peninsula strenuous uphill steeply up to over 300 m and down again via Neo Chorio to the northwest coast. To avoid the Kokkina enclave with inaccessible UN buffer zone, we had to climb steeply inland to over 500 m up and down again before crossing the border into Northern Cyprus. In Northern Cyprus, with the exception of Turkey recognized by no one as a country, it went in heat along the coast again and again to the east. After two short biking days and relaxation at the beach and pool we drove in Kyrenia, or in Turkish Girne. We walked to the castle and through the beautiful harbor and drove the next morning by minibus to Nicosia, the last divided capital of the world! We strolled through the interesting old town of the northern, Turkish part and crossed on foot the border in the less attractive, more modern Greek part, before it went back with the minibus to Kyrenia. In actually always only half days of cycling we went further east to the Karpas peninsula in the northeast of the island. We camped at the Golden Beach, where we had a complete beach day with doing nothing. About partly bad track it went to the easternmost point of Cyprus very scenic over a curve back to the north coast of the peninsula and along it, before we turned to the south and drove along the east coast of the island to Famagusta. On the outskirts of the city lies Varosia, surreal ghost town, abandoned in 1974 in the wake of the Turkish invasion and since then military restricted area. Once a tourist destination, the hotels rot on the beach and the rest of the city and nature gradually reclaims them. We forced our way around the severely shielded ghost town and made an arc across the border into southern Cyprus. In Agia Napa, party stronghold of the island, we put a stop and did what they did here: beach and clubbing! About Larnaka, we then drove slightly hungover along the coast to the west. We wanted to go kiting west of Larnaka, but due to the lack of wind and shelter we drove on to Limassol. There we rented a car because of time constraints, because we wanted to look at the inland as well, but probably would not have made it in time with the bike and the heat made the decision not easy to tackle the way to the mountains by bike. So we drove with a relatively cheap car in the Troodos Mountains up to Platres and Troodos. We walked along the Atalanti Trail, camped east of Troodos and drove close to the summit of Adelfoi, where we ran the shorter Adelfoi Trail. We drove to Moni Panagias Monastery and out of the mountains to Pano Lefkara with its beautiful old town. Then we went back to the coast and on the highway back to Limassol. By bike the next day we continued along the endless Lady's Mile Beach and further west. In Avdimou there was unfortunately no accommodation, so we decided not to kiting and continue on Pissouri Beach along the coast westward. We passed the famous birthday beach of Aphrodite, Petra tou Romiou and cycled back to Paphos only a short time later. There we relaxed a bit at the pool and beach, we did it to the tourists and treated ourselves to parasailing and we just let it go for two more days, before we went by taxi back to the airport. Cyprus had been a beautiful island! It would have been easy to do the track in a matter of days. You could have been traveling faster along the coast and then you could drive through the mountains by bike instead of by rental car. In any case, you should also look at the inland of the island! We had liked it this time as it was.